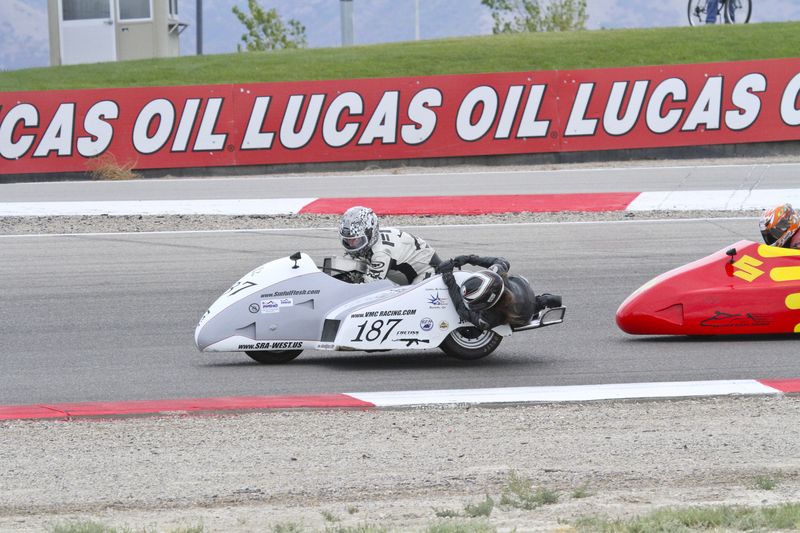 Labor Day weekend is probably the biggest event on the SRA-West racing calendar each year. 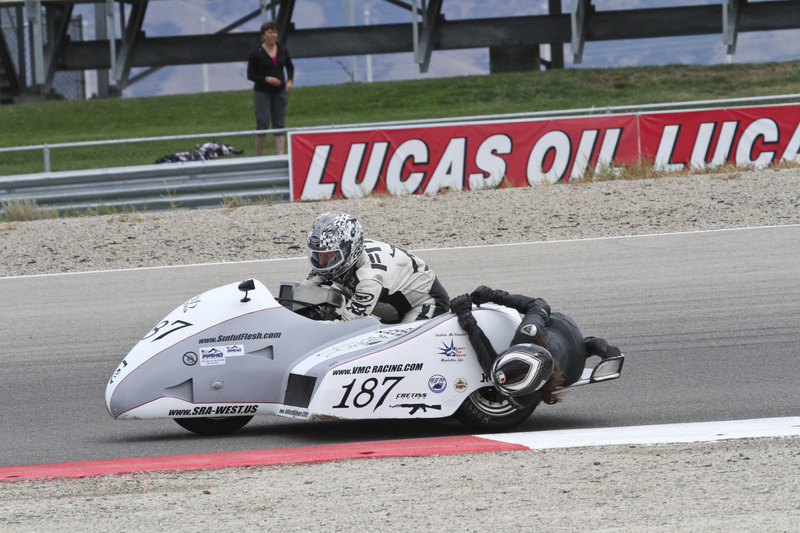 Miller Motorsports Park is a first class venue. AHRMA is a national vintage racing club that hosts the event, bringing in crowds of people who love quirky machines, sidecars included. The East Course is short and fairly tight, but it features some very fast and flowing turns just the same. I’ve classically had terrible luck here. Broken ignition switches, boiling brake fluid, and shagged tires have caused much strife, but this year the bike ran problem free. This was Gina’s first time on this course, but by the end of Friday practice she was dialed in pretty well. Studying the course obviously paid off, as she even had all of the turn names memorized (they are not numbered at Miller, but named), making conversations easier. Saturday’s race was the usual affair I reckon- a six lap sprint that saw us holeshot from the front row and pull away, waiting for Becker Moto Works to catch up from their last-row start. However, passenger Eric Becker wasn’t able to make this event, and passenger duties would be handled by Aaron McEwen. Aaron is still in his rookie season, but has been onboard several fast machines. Still, Aaron is unlikely to weigh in at more than 150lbs, whereas I would estimate Eric to be anywhere from 170-190lbs. With Gina still sitting below 130lbs despite all my attempts to overfeed her, I know that a light passenger can cause difficulties for a driver. Would it be enough? It took Becker/McEwen longer than usual to get through traffic, and by lap four they were behind us, but still struggling a bit to close in. The pass was likely to come in “East One,” the first turn, so I concentrated on the exit of the final turn, “Release.” Problem is, there is a painfully slow turn before that. Everything I tried either had the front end pushing or the rear end in the air, killing drive. Becker had the back part of the track dialed in and finally was close enough to move inside of us on lap four. We put in a serious effort to stay close, but I was starting to get arm pump even before we fell to second. With my right wrist going numb it was really hard to feel the throttle, and we just faded back steadily. By the checkered flag there was almost a straightaway between us. A short distance at this track I suppose, but still a wide margin. For Sunday morning practice all we really concentrated on were the final 2 turns. I tried square approached and arcing approaches, slow entries and fast entries. It seemed that sacrificing the entire corner in order to drive out swiftly was the way to go, but to do so the front tire was sliding away. For it to work I was going to have to guess my exit line from the apex and hold the throttle pinned. If I guessed wrong we would end up on the curbs and perhaps the gravel, which would most certainly send us into the tire wall. Green flag on Sunday and we were in the lead. I saw no reason to try to put in hot laps as I knew Becker would come for us regardless. Saving my arms (and Gina’s entire body), we laid down a lap at about 90% pace. By lap two we were in a groove, but Becker had made his way through traffic sooner this time, so I went into sprint mode. We were able to hold him off in a couple of spots, but there were three spots on the track he made up a lot of time. He was gaining on us for sure. By the halfway mark he was all over us. I could pull out 2-3 lengths, but he would just reel it back in moments later. One bonus was the new line we were using out of the final corner now put us on the line Becker was using. This held his drive up on his first attempt, but he adapted his line and got an amazing drive and was almost completely by us before the start/finish stripe. With him on the inside there was no way to defend the position, so we exited East One with a fist full of throttle. Something unusual happened… we weren’t being left behind. Through high-speed “Faster” we closed in. “Gotcha” was coming up fast but this time I wasn’t going to out-brake myself. The double rights saw us fall behind just a bit, but we made it up on the brakes into the double lefts of “Agony” and “Ecstasy.” I actually had to dial in more brakes to avoid contact, but I got my eyes up and sighted an exit line for the second turn before it was too late. We usually lose time here too since the chair is in the air, and we did, but not more than one length. “The Attitudes” are a tight left-right-left with an important exit. We nailed the exit and were back on Becker’s tail. The final turn onto the front straightaway was a real killer for us. Here Gina and I get it right. Into Tooele turn and I braked a little early to give us space to start an earlier drive. Becker’s machine has 15-20hp advantage on us, but our gearing was so short we could get the initial exit much better. Becker’s machine began to stretch its legs on the long run to Clubhouse Corner, but he also had to brake a bit sooner and we closed back in. I moved us to the inside but there wouldn’t be enough time to get our nose in before Becker turned in. The short-chute to “Wind Up” had us to the inside, but again not enough to work with. This is the right hander where we lose so much time… the second to last turn. We lost almost two full lengths but instead of making it up on the brakes into the final turn, I set us up for the exit. The white flag was out but I was fixated on the first corner. I moved us out of the draft early as I’m getting sick of listening to rocks bounce off our weary paint job. Becker began to brake unusually early and I was still full throttle. We darted to the inside and had the pass initiated as I got on the binders and tried to haul everything down. I could see people on pit wall with their fists in the air (that must be an awesome place to spectate from) as we turned in and had the lead. I expected Becker to do the ol’ “high/low” and sweep back to the inside, so I sacrificed some corner speed and hugged the inside curb. This is a double apex turn though so I had no line to make a good exit from. I didn’t hear of see Becker and assumed he was now caught behind us, waiting for us to get out of the way. We left the second apex with the chair up and the front sliding as well. I grabbed a short-shift into 3rd and pinned the throttle. Just as we are about to clip the curb on the exit I see Becker’s nose… on the outside! He knew better than to get caught behind us and had been on a high corner-speed line around the outside the whole time. He had never even slotted in behind us, and was now out on the curb completely, full throttle with nowhere else to go! Closing the throttle wasn’t an option for me since that makes the chair go higher. Steering tighter wouldn’t do much either, but we were on a collision course. I grabbed the rear brake with the throttle open still and tried to steer harder, but the chair began to wave. I heard our sheet metal hit the ground and felt the bodywork fold in on my foot. I instinctively moved my foot off the brake in case we contacted and harder. After the race several fans came to tell me they could see the entire underside of my machine from the pit wall. Combined with the dust Becker was kicking up while on the curb and they thought the both of us were going off the track and upside down. Becker just squirted ahead of us and I immediately looked for a line inside on the next turn. There was no room so I went “Haga style” and started shoving the nose in on every corner whether there was room or not. This turned out to be a bad idea in the double-lefts of “Agony” and “Ecstasy,” where I out-braked myself and allowed a two-length gap. Becker was on our tail for much of the race. Here he sets up to make a bid for the lead on Sunday. We charged hard through the lap but all we were doing was maintaining the gap. “Wind Up” came again and the gap went to four lengths. My arms were burning at this point and I just eased through the final turn, short shifting the engine to avoid transmission wear, finishing about 2.5 seconds from the lead. I suppose in all the event was like many others. Two races, two second places. Despite how close we were able to stay on Sunday, it’s left to wonder how much of that had to do with Aaron’s lighter weight as passenger. Although I am terrible at writing things down, I do believe we pulled over one second off of my previous fastest time on this course, which is impressive considering this was Gina’s first time to this venue. Not only did Gina do well, but in de-briefing afterward, it was quite obvious that Gina made fewer mistakes on Sunday than I did, by a drastic margin. Now, you might think that since I have more hands on the controls that it’s obvious I would make more mistakes, and I supposed there is some truth to that. I have more opportunity to make mistakes, but think of this; every time I make a mistake the passenger has to figure out what to do. So not only does Gina have to get her timing and position correct, she has to instantly guess when I make a mistake as to what needs to be done to correct it. Add to that the effect of her trying to correct something while I’m trying to correct it, and things can go really wrong, really fast. Gina was able to figure out what mistakes required her to adjust her plan, and what mistakes would be corrected by me… not to mention I beat the crap out of her on Sunday with some aggressive driving. The season ends the first week of November in Las Vegas. It’s unlikely the championship will change for me, but Gina is actually in a very close race for third overall, as she missed and event earlier this year. Stay tuned.